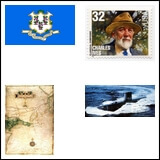 This section lists reading comprehensions on edHelper.com with references to the state of Connecticut. These reading comprehensions were not written specifically for the state theme unit. The Rose Bowl Game: "The Granddaddy of Them All"